How do you know for sure that your website is performing well? You set goals for it, of course. Measurable, trackable goals so you can measure every tactic and campaign you run. See how to do it here. 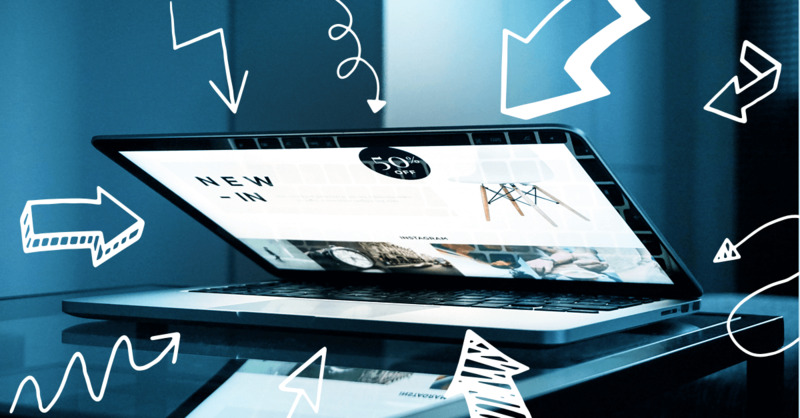 Your website should be the central hub of everything you do online. 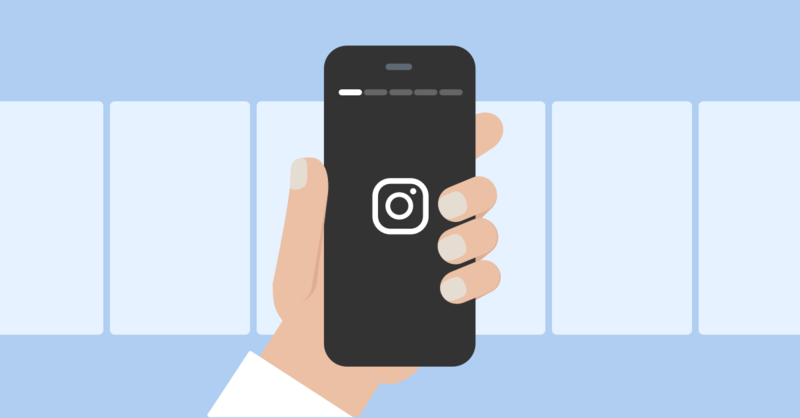 Social media, email, advertising, public relations – all those tactics should eventually focus on bringing people to your website. And once they’re there, getting them to convert. 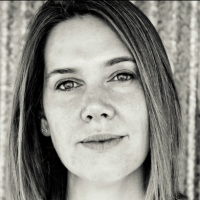 So if websites are so central to digital marketing, how are we measuring their performance? What’s the difference between a “good” website and a “bad” website? That’s what we’ll cover here. 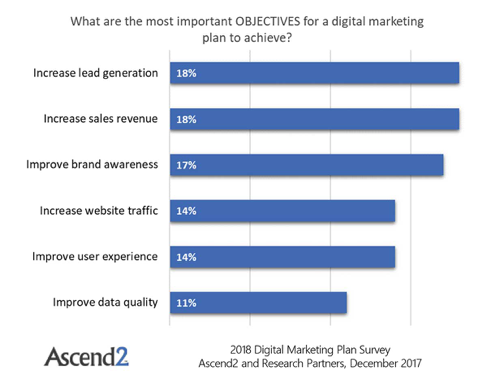 Those are the sorts of goals that appear in study after study on digital marketing, including this particular study from Ascend2 earlier this year. Those are all excellent goals, of course. They’re the sort of things that drive real business growth – real money in the bank. They’re also good because they’re measurable. Highly measurable. And, with the exception of brand awareness, they’re things you measure on your website. This means you can track where you started with your goals, how close you are to achieving those goals, and which specific actions and marketing campaigns are either moving you toward or away from those goals. One of the primary website goals mentioned here is less easy to measure than the others. Brand awareness is something many marketers want to improve, but you’ll probably have to go to a third party company and use their proprietary tools to get a measurement of how aware your target audience is of your brand. 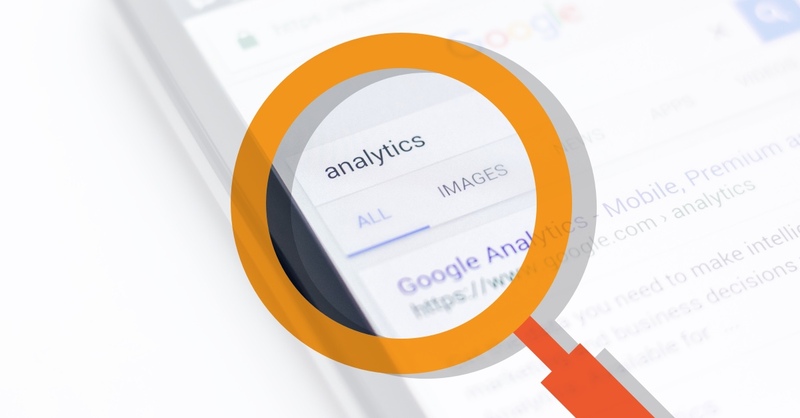 Google Analytics can’t track brand awareness per say, though some people suggest that website traffic and the number of brand term searches are possible measurements of brand awareness. That may be so, but more traditional measurements of brand awareness via social listening or the metric share of voice simply can’t be tracked in Google Analytics. Maybe someday, but not now. This means you’ll need something besides Google Analytics to track brand awareness. But besides finding the budget for an additional tool, it shouldn’t be a problem for Whatagraph users. 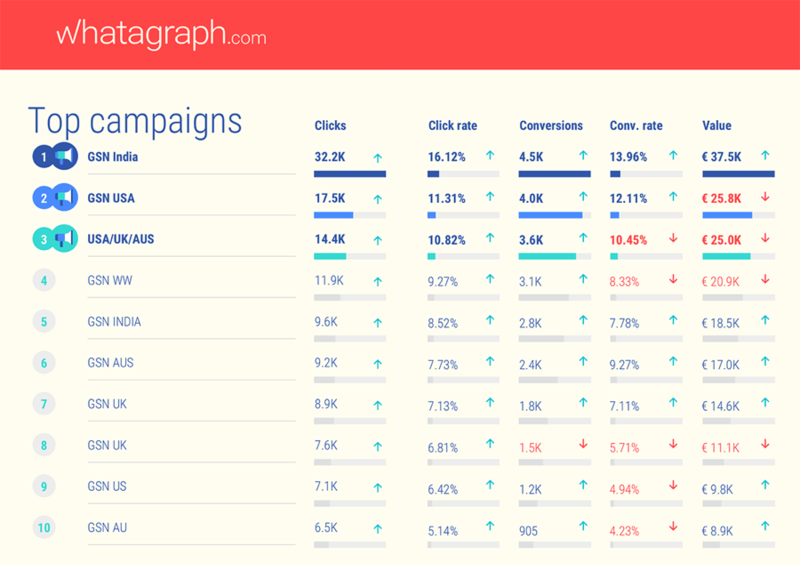 Because Whatagraph lets you merge many data inputs from many tools/sources into one report, you could absolutely have your all your brand awareness measurements and latest stats right next to your Google Analytics goal stats. 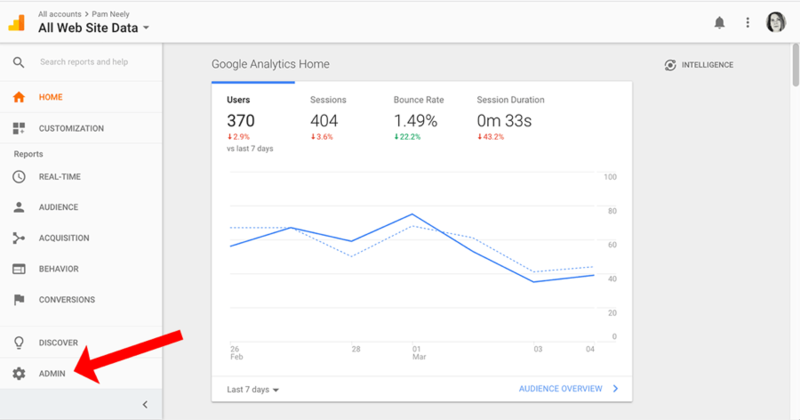 You can still get all your website goal information in one tidy report. So how can you measure all those other website goals? Well, if you’ve got a sophisticated CRM system, you can set goals in that. But if you don’t you can still use the most popular analytics package on the planet: Google Analytics. You can measure all sorts of actions and events in Google Analytics, and then you can add them to your Whatagraph reports so they’ll flow right into the layouts. Then just schedule the reports as usual, and everyone will see how your site is performing. You can also assign values to each of those actions/events/conversions. And then you use Analytics to see which traffic streams (social media, organic search, paid search etc) generated those conversions. 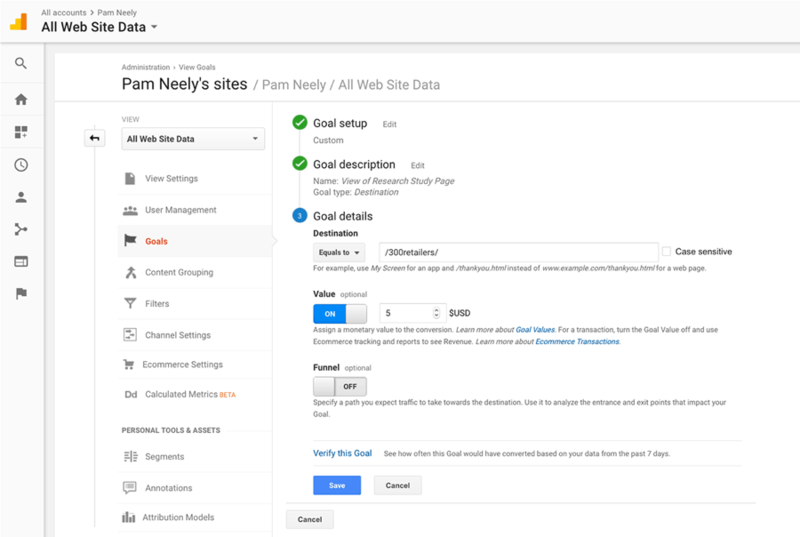 There are four types of goals you can define in Google Analytics. Let’s walk through when and how you might use these. Destination: This is for when you have a conversion where a specific page loads. A visitor will only see this page if they’ve completed the conversion action. Typically, this is a “thank you” page – thank you for subscribing to an email newsletter, thank you for ordering, thank you for downloading a white paper. People only see this page after they’ve completed a specific series of actions. 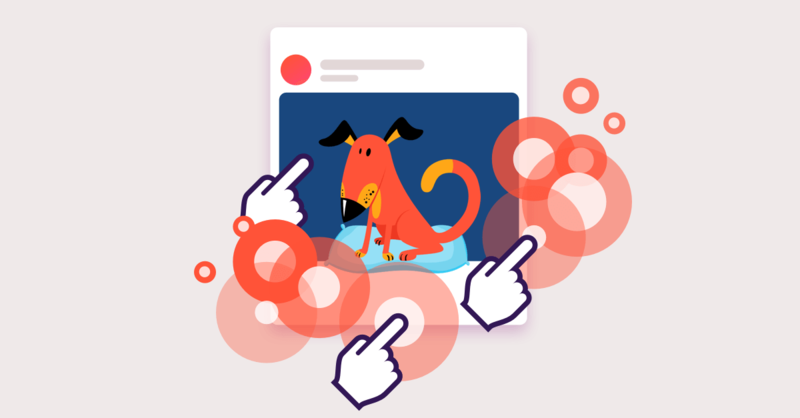 Duration: Want to increase engagement across your site? A duration goal might be ideal. With this goal, you can call a page visit a conversion if someone views a page for a certain period of time. So say you want people to spend at least 3 minutes on an interactive infographic you’ve created. This type of goal would be used to track that. Pages/screens per session: Here’s another type of goal that measures engagement. Here it’s how many pages a visitor views. Event: This is a much more flexible conversion, and because of that it’s probably a conversion you could use a lot. 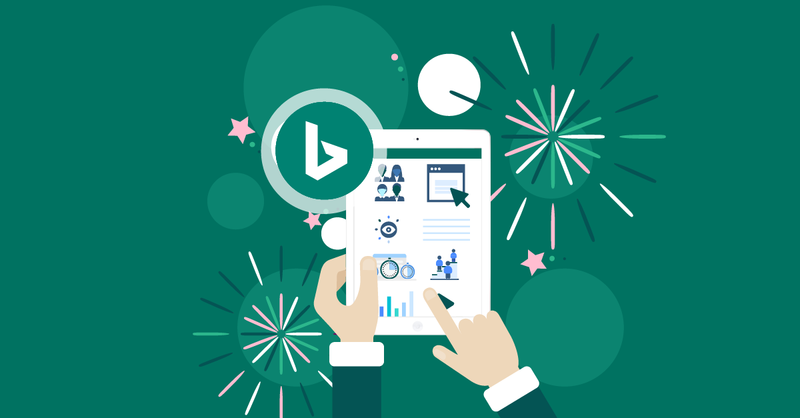 To track events, you’ll first have to add basic page tracking to your site. There are instructions for how to do that here. Part of that setup requires adding the tracking code to every page of your site. You can also set up event tracking for mobile apps. The instructions for how to do that are here. Once the basic tracking is set up, you can define events and how to track them. The help pages for how to do that are here. *Code warning: If you are not comfortable with coding, event tracking may be difficult for you. Consider hiring a developer to set it up. But if you’re familiar with Google Tag Manager, you can track events with that. The instructions for how to use Google Tag Manager for event tracking are here. 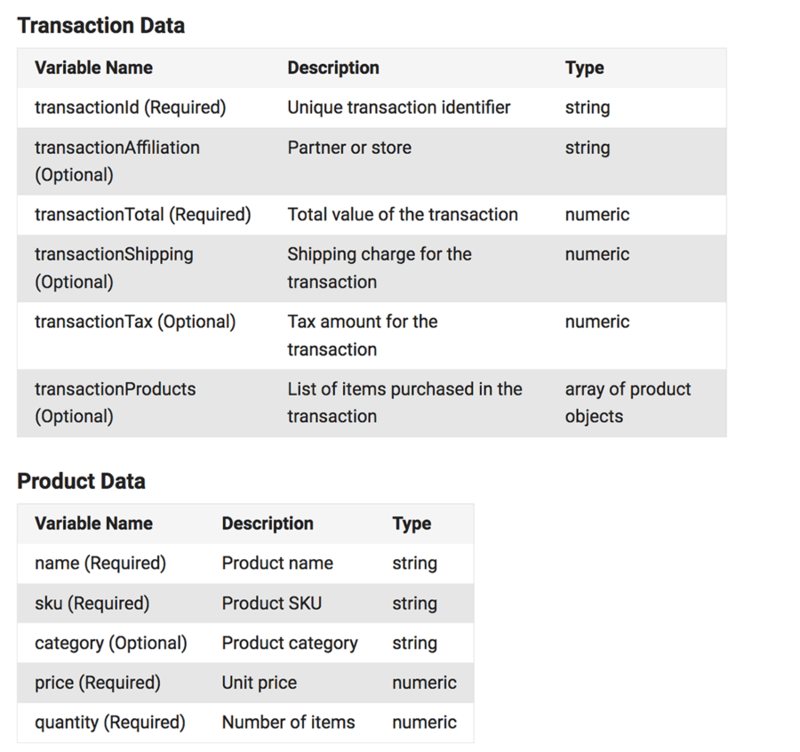 You can also use Google Tag Manager to track ecommerce activity. The instructions for how to do that are here. Again, you’ll need to install tracking code on every page of your site. You’ll also have several parameters you can track. All that flexibility is great, but it comes at a price: It’s complicated to manage. 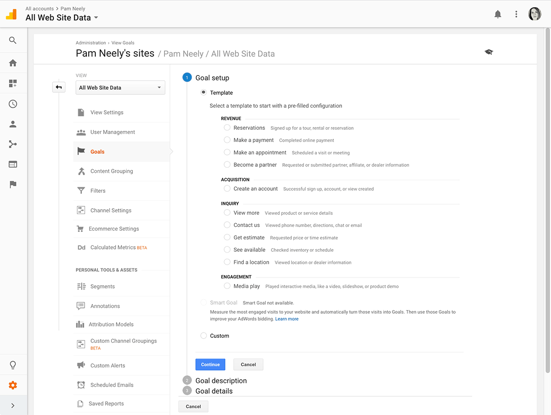 We’re giving you a high-level view of all these advanced tracking features to let you know what’s possible with Google Analytics. It is a seriously powerful tool. But if you’re not an advanced coder or a full Analytics wonk, you may want to just stick with using the basic types of goal tracking – destination pages and duration goals. They’re much easier to set up, and you can usually track most business-related goals with them. In other words, you can probably get 80% of your tracking goals defined and set up yourself with those two types of conversions. Events are cool to track, and you may want to track ecommerce conversions down to the penny, but unless you’ve got an IT department or a developer on hand, they can be kinda daunting to set up. So if you’re on your own, don’t avoid using goals altogether just because these advanced tracking setups sound hard to set up. In other words, keep it simple. You can track a ton of stuff on your site with simple goals. So you don’t need to set up the Starship Enterprise version of tracking… but… you’re spending money here. Maybe a lot of money. And so you need to be able to quantify the value of some of these goals. You can also define a monetary value to any goal you set up. It takes a minute to add this information, max. We’ll show you how to do it later in this post when we set up an actual goal. 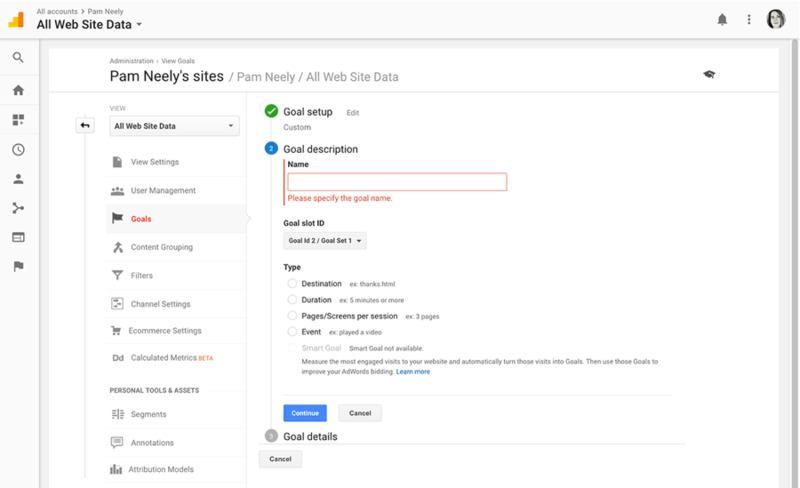 You can also hook up your Analytics goals with your AdWords account by using Smart Goals. Then you can see the conversion rate in your AdWords reports, or in your Whatagraph reports. How many goals can you have? 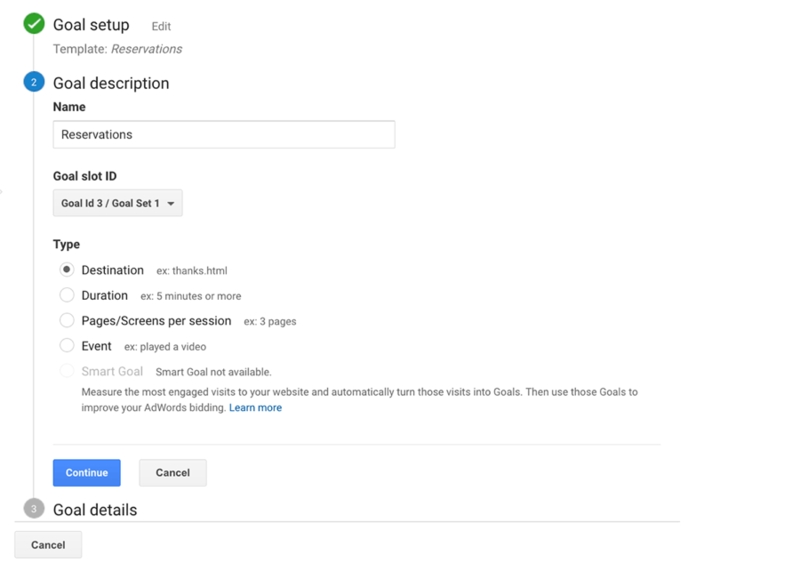 For standard Google Analytics goals (not the Smart Goals mentioned above) Google says you can have “up to 20 per reporting view”. Creating a second Analytics view isn’t hard, and you can up to 25 views per “property” (Google’s term for a website). But if you want to keep things tidy, it might be smart to limit yourself to 20 goals. As you can see, 20 conversions lets you do quite a lot. If you did need more goals, you might want to organize them so all of one type of conversions are kept together in one view of Analytics. For instance, say you’ve got 20 different ebooks, whitepapers and other downloadable assets, and you want to track each one. In that case, it would be smart to have a separate view in Analytics for all those types of conversions. It’s also smart to set a time limit for some goals. Take “Webinar signup 1” in the list above. After that webinar is done, you don’t need to keep that as an actively recording conversion. So you might want to turn that goal off after you had pulled a few reports to assess how well the different tactics you used to get people to sign up performed. You could also change that goal so that it tracks when people access the on-demand version of the webinar. You can’t actually delete goals in your account, but you can turn them off so they stop recording. Again – if you do a lot of webinars, and want to track each one, consider adding another view to your “property” (Google’s term for your website). That way you can see all the performance data for your webinars, or for any particular type of conversions, in that view. If you really get into goals, and if you change their status a lot, you should keep a notebook to track how you manage your Analytics goals. Or, if you trust Google Analytics’ “Change History” feature enough, you could use that. Just make sure you have some reliable way to remember what you did, when you did it, and why you did it. Time flies, and very few of us will remember detailed specifics of campaigns that ran even a year ago. So enough theory and feature talk. Let’s show you an actual example of how to set up a goal. A simple goal. Say you want to track leads generated from your website. Your lead generation form redirects to a thank you page, and so this makes tracking really easy. 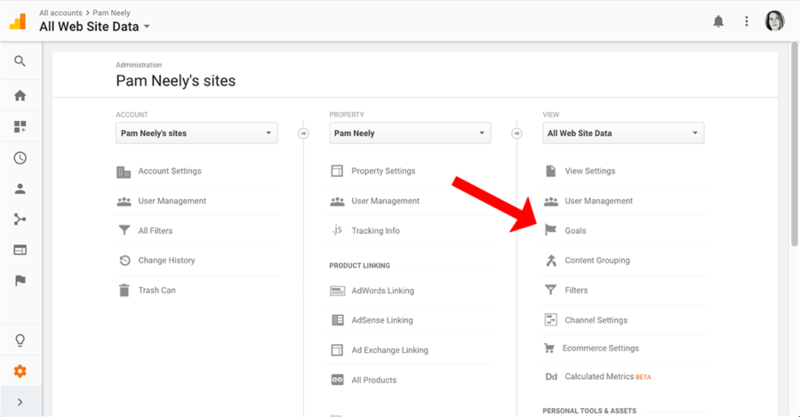 Log into your Google Analytics account and go to the main page of the website (aka “property”) you want to set the goal up for. Find the Admin link in the lower left-hand corner of the screen. On the next page, look for the “Goals” link in the third column. On the Goals page, you’ll see a list of any goals you already have set up. Here, I’ve got just one previous goal set up to track email newsletter sign-ups. I want to create a new goal, so I’ll click that red button that says “+ New Goal”. This is the page you’ll see next. Quite a lot of options, right? Don’t let them scare you. If you choose any one of those four types of “template” goals, you’ll next be asked to pick whether you want to specifically track a destination, duration, pages/screens per session, or an event. By now, you know what all those four options mean, so they shouldn’t be too scary. Actually, I usually choose the “Custom” option. It looks identical to the template options, but I can enter my own custom name for the goal. I could have set up a funnel for this goal. That’s just a series of pages that someone would need to view in order for this to be considered a completed goal. I don’t need to be that restrictive, so I just skipped that section. Next they want me to verify the goal. This is really easy: You just click the button. The interface will tell you how often this goal has occurred in the last seven days. This particular page is rarely visited, so the interface shows that it hasn’t gotten any conversions in the last 7 days. I’m just setting up a dummy test, so that’s fine. To finish, I just click the blue save button. The page reloads and brings me back to the main goals page. Except now, my new goal is listed along with the old goal, and the new goal is “recording” – it’s all set up to count every new conversion. Not so hard, right? That took barely five minutes. And now, going forward, I’ll know exactly which tactics and campaigns are actually driving this type of conversion. That will make my work much more focused… which is why goals are so good to set up in the first place. 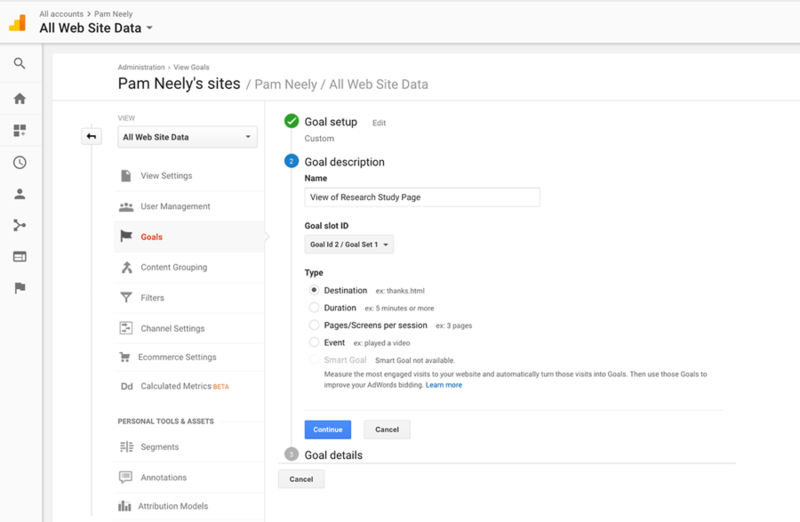 Tracking goals on your website doesn’t have to be hard. 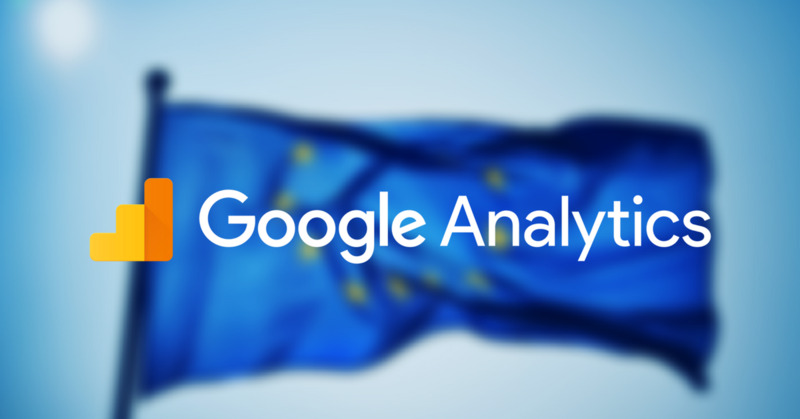 Sure – there are some very sophisticated tracking setups you can use in Google Analytics. But you can also just stick with tracking page views for basic conversions on your site. And with 20 possible conversions to work with at a time, you can have a pretty active marketing program going without ever needing to add a second view. Once those conversions are set up, you can add them to your Whatagraph reports and schedule them to go out automatically to you or your team members whenever you want. You never have to set up the report again – it will just run in the background, and send you updates once a week. That saves you time, so you can develop new ways to get even more conversions.